Ride with your friends, family, cycling buddies or colleagues and enter Great Cycle Challenge Canada as a team! You don't need to physically ride together, your team members can be riding from any location in Canada (or even overseas). As a team, the kilometres from all team members will be totalled together on your team profile page to enable you to track your teams overall progress throughout the month. Not sure if you want to register a team? No worries! Simply register yourself now and create your team at a later date - it's easy! Check out our teams leaderboard to see the teams already registered for this year's event. Teams can consist of any number of riders (as long as there is more than 1 person) and you can create a team with your friends, family, colleagues or local cycling club. Create a company team and ask your colleagues, clients and suppliers to ride with you to fight kids' cancer! You could create one team for your entire company or create a team for each branch / office and promote some healthy competition. Don't forget to ask your company to support their employees by making a company donation or matching your teams fundraising efforts! You can also track your progress against other companies within your industry - so challenge your competitors to sign up and ride to fight kids' cancer! 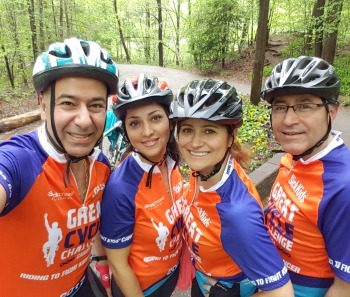 Sign up for Great Cycle Challenge Canada with your local cycling club or bike shop and join your lycra-loving friends to ride throughout June. You can also compete against other cycling clubs / bike shops across the country or within your local area to see who can make the biggest impact to fight kids' cancer! Keep things simple and form a social team with your friends. Use it as an excuse to get out on your bikes together for some weekend exercise. Your team could even just be you and one friend, it's up to you. Gather your family members and ride together to fight kids' cancer! Last year, we had lots of family teams where the parents and kids got involved...even the youngest family members were riding laps of their driveway to add to the team total! Your family can even ride in support of a loved one and display their name, picture and story on your team profile page. Get your school involved and encourage your students and teachers to ride together throughout June. Involved with a local community group? Get them together and create a team to have some fun and get some exercise. You can create a team with anyone for any reason, it's completely up to you.